SpaceX CEO Elon Musk discussed more technical details about the BFR system designed to take people to Mars and on point-to-point trips on Earth, but didn't discuss financing of the system. WASHINGTON — SpaceX Chief Executive Elon Musk disclosed additional technical details about his proposed BFR launch system Oct. 14, although he offered no additional information about the costs and financing of the vehicle. Musk, in a freewheeling "Ask Me Anything" discussion on Reddit Oct. 14, held on just two hours' notice, answered a variety of questions about the BFR design he unveiled Sept. 29 at the International Astronautical Congress (IAC) in Adelaide, Australia. That design is a revised, and slightly scaled down, version of the vehicle he announced at the same conference one year earlier in Mexico. "Will be starting with a full-scale Ship doing short hops of a few hundred kilometers altitude and lateral distance," he wrote. "Those are fairly easy on the vehicle, as no heat shield is needed, we can have a large amount of reserve propellant and don't need the high area ratio, deep space Raptor engines." That is similar to what SpaceX President Gwynne Shotwell said at the Oct. 5 meeting of the National Space Council, when asked about development of the BFR system. "That system is being designed also to do Earth hops, and those are some of the first tests that you'll actually see with the Falcon spaceship," she said. The spaceship itself, Musk said, is capable of reaching orbit without the assistance of a booster, but with only a "low payload" that he did not specify. "Earth is the wrong planet for single stage to orbit. No problemo on Mars." Musk also addressed changes in the Raptor engine, the large engine powered by methane and liquid oxygen that will power both the booster and the spaceship elements of the BFR system. The original Raptor design, announced last year, was capable of producing more than 680,000 pounds-force of thrust. The revised design announced at last month's IAC produces only about 380,000 pounds-force of thrust. "The engine thrust dropped roughly in proportion to the vehicle mass reduction from the first IAC talk," Musk wrote when asked about that reduction in thrust. The reduction in thrust also allows for the use of multiple engines, giving the vehicle an engine-out capability for landings. He added that, since the presentation last month, SpaceX has revised the design of the BFR spaceship to add a "medium area ratio" Raptor engine to its original complement of two engines with sea-level nozzles and four with vacuum nozzles. That additional engine helps enable that engine-out capability, he said, and will "allow landings with higher payload mass for the Earth to Earth transport function." Musk was optimistic about scaling up the Raptor engine from its current developmental model to the full-scale one. "Thrust scaling is the easy part. Very simple to scale the dev Raptor to 170 tons," he wrote. "The flight engine design is much lighter and tighter, and is extremely focused on reliability." He added the goal is to achieve "passenger airline levels of safety" with the engine, required if the vehicle is to serve point-to-point transportation markets. The discussion focused primarily on the technical aspects of the BFR system. Musk did not address any financial questions, including the cost of developing the vehicle and how the company will finance it. "I think we've figured out how to pay for it," Musk said in that speech, but didn't discuss specifics beyond retiring the company's existing Falcon and Dragon vehicles so that those resources can be applied to BFR. Musk did reiterate that the company's long-term goal with the BFR system is the settlement of Mars, but that the actual establishment of a base was something that would be handled largely by other companies and organizations. "Our goal is get you there and ensure the basic infrastructure for propellant production and survival is in place," he said, comparing the BFR to the transcontinental railways of the 19th century. "A vast amount of industry will need to be built on Mars by many other companies and millions of people." 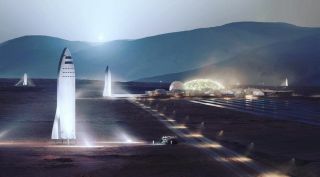 Asked about an animation from his IAC talk that showed a time-lapse development of a Mars city, Musk cautioned that was not intended to be a specific, detailed design for such a settlement. "Wouldn't read too much into that illustration," he wrote. Throughout the discussion, Musk engaged in lighthearted banter with questioners. Before going into the technical explanation of the reduced thrust of the Raptor engine, he wrote simply, "We chickened out." Later, asked why the BFR spaceship now had four landing legs, versus the three in the design released last year, he responded, "Because 4." He then added, "Improves stability in rough terrain."